Breaking down from start to finish, two actual rehabs, Alan Murray and Carrie Copenhaver presenting. Rehab case studies by the numbers. We will break down from start to finish, two actual rehabs, Alan Murray and Carrie Copenhaver will be presenting. Carrie has been rehabbing since 2006 and Alan since 2010. 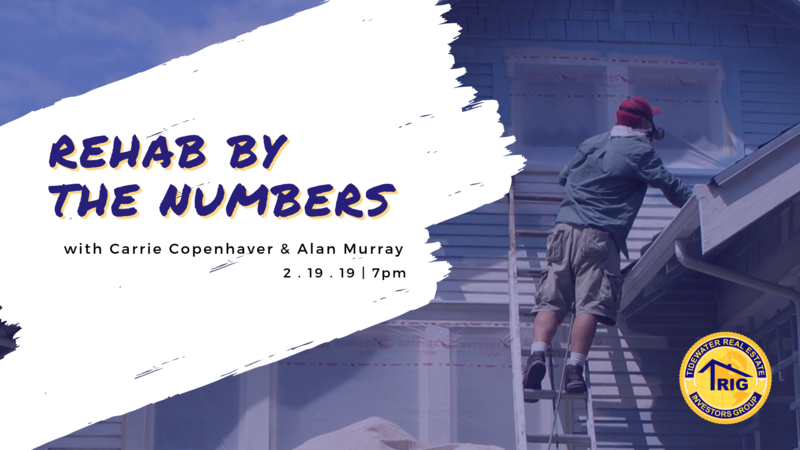 They'll both share the LARGEST deals they've ever done in their combined 20+ year history as rehabbers and give you details on a deal that's poised to make a 6 figure profit. Get ready to be taken step by step through the entire rehab process: the issues encountered with buying, analyzing the property, to funding, to determine the scope of work, projected budget, actual expenses to sale HUD and amount of projected profit margin. This presentation will be a comprehensive, deep dive into what an actual rehab looks like - pitfalls .. the good, the bad & the ugly. You don't want to miss it! Doors open at 6:30 pm for networking. Carrie Copenhaver: Carrie is a 3rd generation real estate entrepreneur. Both her father & grandfather were custom home builders in the Hampton Roads area. Carrie received her real estate license in 2005 and was awarded Rookie of the Year in 2006. She primarily works with Sellers to create solutions for their real estate challenges, often purchasing their “ugly” houses. She truly loves creating win-win-win solutions… by rehabbing & restoring properties, everyone benefits – the Sellers are able to move their problem property, the Neighbors greatly appreciate us fixing the neighborhood “eyesore” & the Buyers receive great value & peace of mind when they purchase a renovated property. Alan Murray: Alan transferred into the Tidewater area in 1981 with the US Navy. He was medically discharged in 1989 and worked as a Government Contractor until 2010. In 2010, he married the love of his life, Heather. Life threw a curve ball at them and they swung for the fences. They decided to begin their journey into Real Estate Investing. Their first rehab property wasn’t a home-run, but it proved to them that they could do this. At that moment, Alan became a ‘full-time’ real estate investor. He opened Tytan Properties, Inc. in 2011 and has been rehabbing properties with his wife since then. He has been a member of TRIG since 2012 and became a board member in 2015 and became Vice President in 2016. Alan now wholesales, rehabs, does buy & holds and has built new construction.